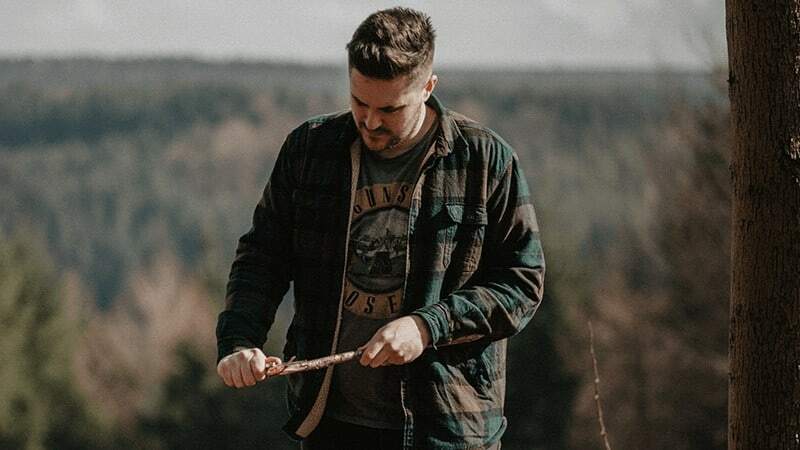 Whittling is a skill well worth attaining, it is entertaining, teaches patience and tact, and can produce worthwhile items when you’re in the field. Something as innocuous as a spoon can be a valued commodity in the right scenario, and knowing how to whittle your own is key to making do. But before you get whittling, you need the right knife for the project. 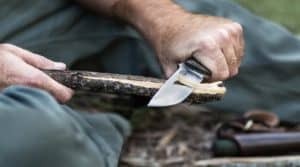 We’ve put together 7 of the best whittling knives available for you to peruse and choose from. Let’s get to it by first looking at what goes into a good blade. The best knife for whittling is the best one for the project at hand. Sometimes a larger blade is more useful for larger projects like tent stakes and bows, but a smaller and thinner blade is perfect for detail work. 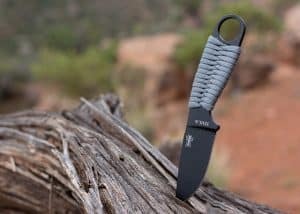 Devotees of Primal Survivor know my preference and downright adoration of simple, no-frills craftsmanship, so you’ll understand if I’m biased when I say this Morkniv 106 is the best on the list. A simple handle shape perfect for any hand and a sharp, narrow blade are perfect for most projects. I’d be confident whittling the finest details into a fine piece of basswood with this knife. On top of that I think it’d do fine as a general utility knife when you don’t need a big Bowie or something similar. Heck, I’d gut and clean fish with that knife! We’ll start with one of the more popular knives for whittling, the Whitlin’ Jack. This folding knife features two different blades: one for rough cuts and removal of bigger chunks of wood and a smaller blade for more detailed work. Two knives in one makes this a big space saver. The blades are razor sharp even for a whittling knife, and great caution is recommended when you sharpen yours. Those sharp blades go a long way when it comes to finishing the job, but they are also found of cutting open the fingers of the reckless! The handle on this knife is sturdy and seems to be more comfortable than many others. What’s better than two blades in one? How ‘bout three? Including a third and larger blade allows this folder to add an entirely new range of projects to the list. Those razor sharp FlexCut blades are on full display here, and that excellent handle shape seems to invite the wielder to practice the most complicated projects. Finding a knife of this quality for the price is rare. Cheap knives are found aplenty, but an inexpensive and high quality blade meant for constant woodworking is worth the purchase. The BeaverCraft company is known for producing only the highest-quality knives. 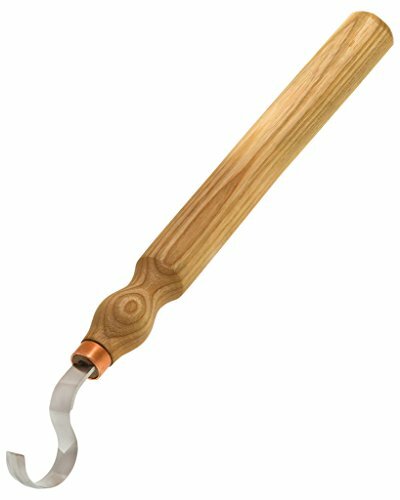 I like the handle of this a lot, it’s comfortable and allows for maximum wrist mobility while whittling. Many knives have a crescent-shaped handle, but not this one. It’s perfect for smaller projects but could do the work of some larger ones if you’ve got patience. I love Old Timer knives, and this one is pretty sharp (accidental pun but I’ll take it). This is a nice knife because it features a saw blade which can be incredibly handy in the right situation. Add a pair of tweezers and a pick and you’ve got yourself one great whittling multi-tool. Reviewers suggest NOT to use this knife for heavy-duty projects, and I am inclined to believe them. 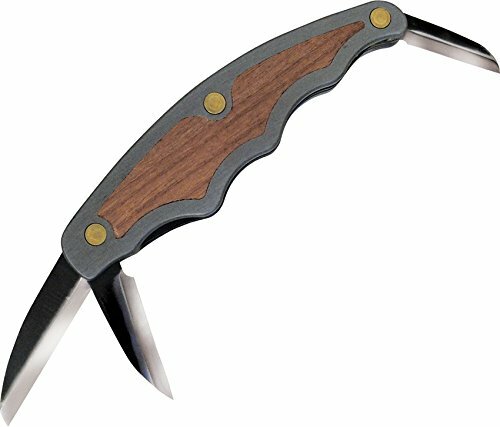 This does seem like a general purpose pocket knife that functions perfectly for whittling, but not Game Day level bushcraft. Don’t worry, woodworking enthusiasts, I didn’t forget the Opinel No.8. This is a beauty and a great knife to have in your pocket. 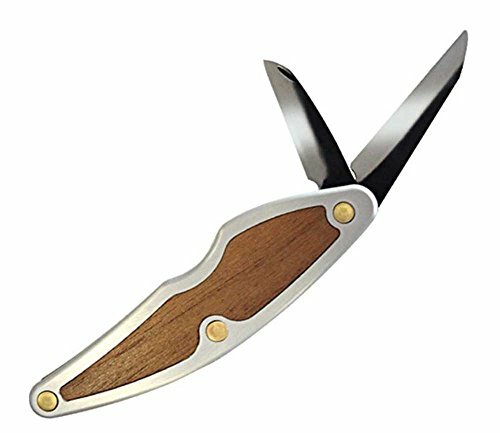 It’s a folding blade, a very nice feature for such a specialized tool; you can safely stow it anywhere on your person or in your bag. 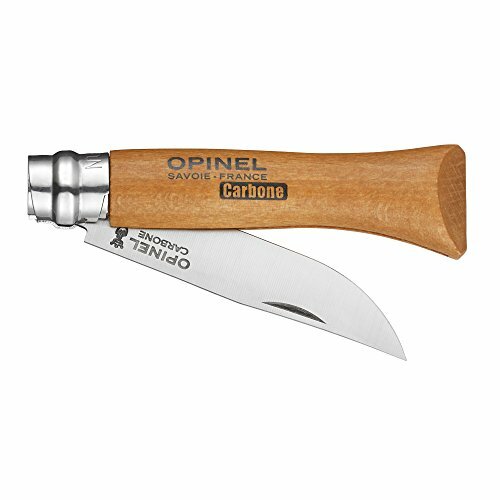 Made in France the Opinel No.8 is sharp and rugged, and it carries a product malfunction guarantee. It features a stained beech handle, which is pretty exciting for woodworkers! 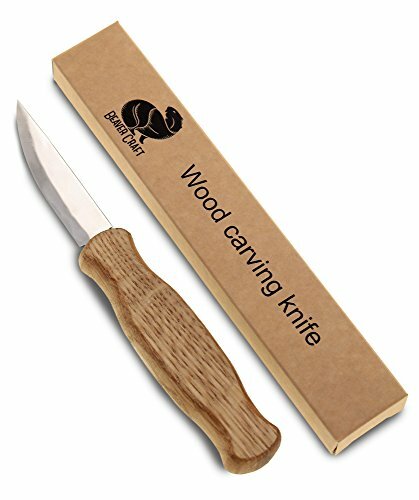 Might as well get to whittling with a high quality wooden-handled knife! Woodworking knives are a specialized tool, but this Beavercraft model brings it to another level! The hook-shaped blade is intended to be used when carving and shaping wooden bowls and spoons. It’s a perfect tool when other knife blades are too long or unwieldy for these precise cutting jobs. 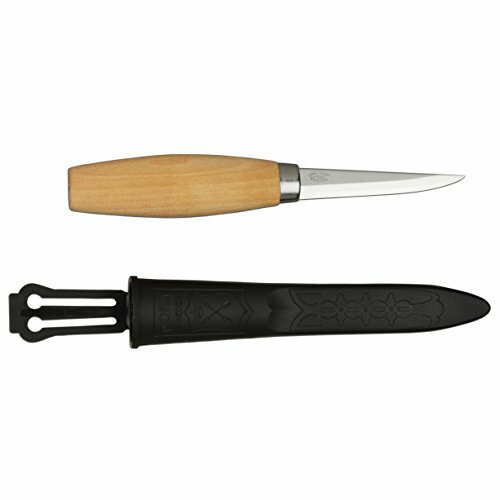 This hyper specialization makes this whittling knife perfect for carving any object with a rounded shape (like the spoon or bowl mentioned above but also ornamental carving). If there’s a hangup, it’s that this hook knife is best used in conjunction with another more standard knife. That means you’ll need to carry two, but man, this is a nice tool for finishing some of those projects. What good is your whittling knife if you aren’t maintaining it to be at its best? 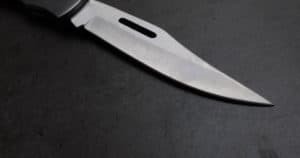 Dull knives are significantly more dangerous to the wielder than a sharp one, and a blade corroded with rust and pitted with notches is unsafe to use by itself. 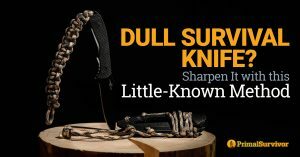 Like any blade you want to ensure you keep your whittling knife sharp, dry, clean, and honed. Since whittling knives are carving through wood and need to be sharp as hell they need to be wicked sharp. While I use a whetstone on my gardening pruners, a whittling knife needs something different. Pop a stropping block like this one into your pack and save yourself some effort while sharpening your blade. If you keep your knife stropped during and between projects the need for an actual sharpening is minimized. 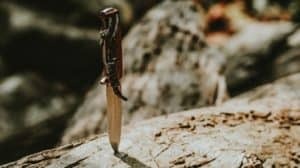 This video is excellent for a demonstration on how to sharpen your whittling knife, and the comments below it are actually quite helpful. How weird is that for a YouTube video?! If you use something like the stropper in the link above, use the 3000 side in place of sandpaper! Wipe your blade down with a dry cloth between projects to keep it clean and free of damaging debris. If it gets dirty, most of the time warm and soapy water is your best best to clean it. You only get one pair of hands, so it’s wise to invest in a good pair of gloves or a thumb pad to keep your digits in working and uninfected order. This thumb pad is reviewed with high accolades and is one of the best on the market. A regular pair of gloves can help protect your fingers from an errant slip of the blade, so a good pair is worthwhile. Our glove buying guide can help you pick out the best for what you need. Born and bred in rural Pennsylvania, Matt embraced the backwoods lifestyle. An early exposure to knives, firearms, gardening, and foraging developed him into the outdoorsman he is today. Matt is fueled almost entirely by beer and hot sauce. 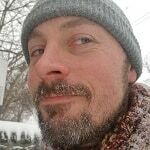 Learn more about Matt here.